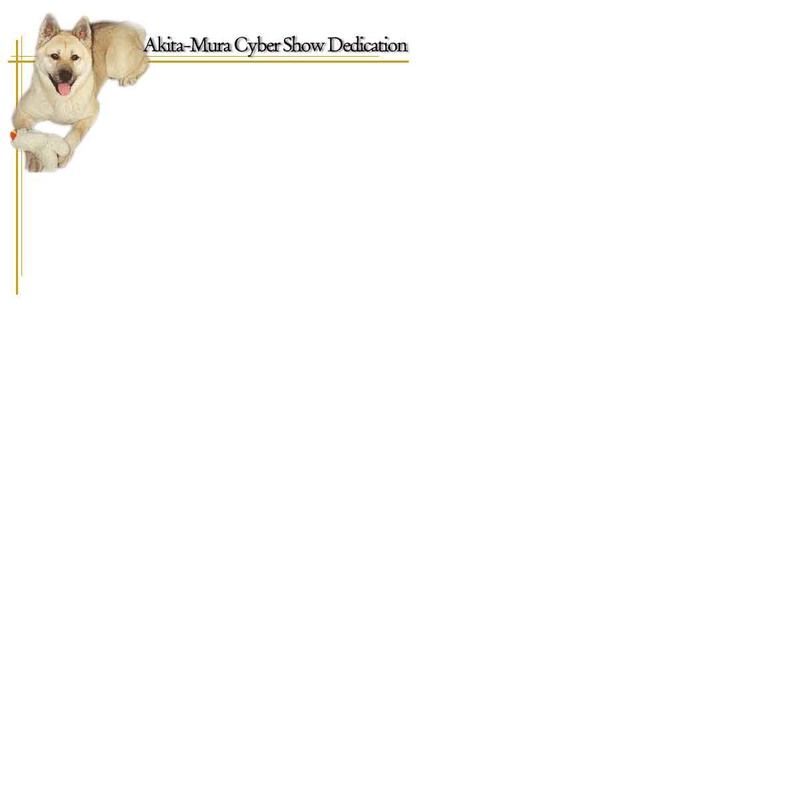 countless Akita Rescues needing our help, and to collect funds for their care. Thousands of Akitas are given up, taken to shelters, or worse, abandoned and left to starve with no hope of survival. After 3 weeks of living on rainwater, Kiri was down to 50 lbs. and Tamashii only 40 lbs. and near death. Akita rescue was contacted, but due to the weakened state of both dogs, vaccinations would have to wait, and a public boarding facility was not an option. A private individual was found who had one open kennel, and was willing to foster these dogs. After a few months of regular feeding, both dogs regained their health and normal weight. Unfortunately, it was at this time that Kiri also came in to heat, unnoticed by her caretaker. She became pregnant by Tamashii just before Tamashii was neutered. 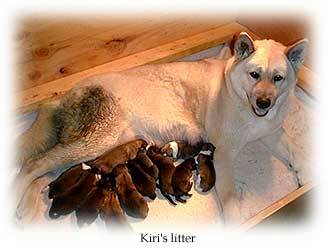 Her pregnancy progressed, and when recognized, Kiri was brought to the vet's office to confirm her pregnancy. It was determined she was too far along with her pregnancy for a spay/abort to be safely carried out. 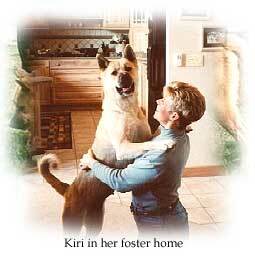 Kiri eventually recovered emotionally from her loss, and became a "house dog" for the first time in her life. It was discovered that she was quite the clown, smart as can be and extremely energetic. 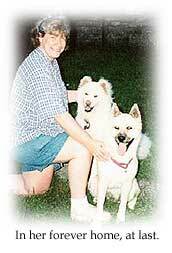 She loved nothing more than to spend time with the family and play with the resident male Akita. She developed a whole new repertoire of tricks, and loved to go for rides in the car. The resident female (Akita), however, was extremely upset that this interloper was spending time at her house and their mutual animosity was making life difficult, to say the least. Despite her foster's falling deeply in love with Kiri, it was realized that she must find a home of her own, for safety's sake. Doing this was quite a challenge, because despite Kiri's wonderful qualities, she had been abused in the past, and it took time for her to trust new people and she had an initial dislike of men in general. After 8 long months of juggling dogs, God sent Kiri the perfect home. Her new home was with a single woman, no kids, who worked out of her home and already had an older longcoated Akita rescue. Kiri adapted quickly to her new home, and took her couch privileges seriously! As an added bonus, she lived close enough for her foster parents to visit regularly. She is now a much calmer dog, who has learned to trust people and enjoy life to the fullest. Her older companion went to the Rainbow Bridge last spring, and even though she misses him, she is enjoying her only-dog status at this time. And after being neglected and nearly starved to death at one point in her life, Kiri now rarely misses a meal! On behalf of Kiri, and all of the other deserving Akita rescues out there, we want to thank you for participating in Akita-Mura. 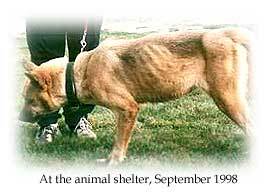 The success of Akita-Mura demonstrates that despite the ideological and personal differences of those devoted to the Akita breed, we can all pull together to help end the suffering of our own Akita's less fortunate relatives.